The AZ1VR is really neat and simple to use. You fix the camera to your helmet (or handlebars, or surfboard), strap the remote to your wrist, make a few camera set-up adjustments, hit Record… and go! The AZ1VR is sold as a kit that includes a removable 5M waterproof case, a selection of mounts and the wrist-worn LVR2V live view remote. The Sony AZ1VR comes with a waterproof case and a selection of mounts. Initial setup and connection between the camera and remote is an easy process requiring a few button presses to pair the two. Once they're connected, you can use the remote to start or stop recording, access all the video quality settings, activate SteadyShot image stabilization and GPS, as well as displaying the live view preview on the small screen. The AZ1VR also shoots 8MP stills. Resolution is surprisingly good though the superwide lens gives a 'fisheye' effect. 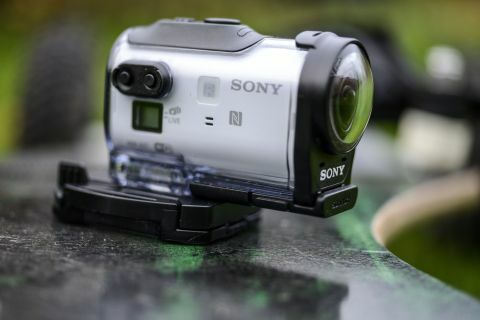 The live view itself comes through in surprising crisp quality and the delay between events and the preview on screen is generally less than a second, which compares well with other action cameras that use wi-fi connection. The remote is rather bulky but the rubber and velcro strap is comfortable to wear and just about large enough to be worn over a jumper – but you'd be pushing it to fit it over a jacket, which is a shame because that would be handy when skiing. If, however, you want to operate the camera directly then there are a three direct control buttons on the body. The on/off and Wi-Fi mode selection buttons are on the side and are both quite small and difficult to use when wearing gloves, but then again this also stops you from hitting them accidentally. The important start stop record button is placed on top of the camera, along with a hold slider that deactivates the record button preventing it from being accidentally hit when the camera is on or off. These controls are well placed and large enough to operate easily in most conditions. Some of the AZ1R's buttons are small, but the wrist-mounted remote gets round that problem. There is a small LCD on the side of the camera which simply indicates Wi-Fi settings, MicroSD card and battery status. On the back of the camera there are three different access covers crammed into the small space. The first reveals the Multi port where a USB can be plugged to charge or connect to a computer, below this is the MicroSD or Sony M2 card slot, and then to the left of this is the battery door lock. Battery life for action cameras is always an issue due to the small size, but the AZ1VRs' minute cell lasted for a good 80mins. This is a little shorter than many other action cameras, which generally hit 100-120 mins, but because the live view remote enables easy composition and operation, one battery lasted just as long in our tests as the GoPro Hero4 and the iON Air Pro 3. The AZ1VR is capable of capturing 1080p video at 60fps, which is impressive seeing as how it's physically 30% smaller than its sibling the AS30V. Not only that, but it also offers the XAVC S format, which doubles the bitrate at which footage is captured. The highest quality .mp4 setting captures 1080p at 60fps at 28mbps, whereas using XAVC S at the same resolution and frame rate the footage is captured at 50mbps. When viewing the footage back the difference in quality is apparent; the XAVC S footage shows far greater detail in the tones and retains crisp contrast and sharp edges, this is especially apparent when motion is introduced, which in the .mp4 format footage can result in a softened look that lacks detail. Recording in standard .mp4 format does however enable 720p resolution at 120fps, this faster frame rate is ideal if you want to capture slow motion footage that once edited will stretch one second of real time video over four seconds in smooth slow motion.